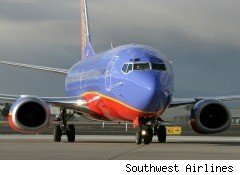 According to the American Customer Satisfaction Index's annual report on airlines, released this week, overall satisfaction is down, but Southwest Airlines (LUV) remained far and away at the top of the list with a score of 81 out of a possible 100. The No. 2 airline for customer satisfaction was Continental (CAL) with an overall score of 64. Southwest's rating rose 2.5%, but Continental's was down 9.9%. The rating for the industry was 65, down 1.5% from last year. Airlines rank last in satisfaction among all industries measured by the ACSI. American Airlines (AMR) posted a score of 63, followed by Delta (DAL) at 56, a 9.7% drop. "Airline mergers typically have a destructive effect on passenger satisfaction," said Claes Fornell, founder of the ACSI and author of The Satisfied Customer: Winners and Losers in the Battle for Buyer Preference. Baggage fees and fuel surcharges were among the primary causes for the drop in satisfaction. Southwest is one of the youngest large airlines in the U.S., founded in 1971. The company's original CEO, Herb Kelleher, was a stickler for customer service. He encourage pilots to help load luggage and stewardesses to help clean planes. Kelleher, who was active in the airline's management until 2008, would ride Southwest flights routinely to ask customers what they thought of the airline's service. Southwest has probably done well with passengers because it was never involved in a huge merger. It has also remained something of a regional airline. It offers few overseas flights and generally avoids expensive routes into cities like New York. This has allowed it to limit exposure to airports which may have large and complex operations. Delta's lower numbers probably reflect travelers' dissatisfaction with the results of its merger with Northwest, which was announced in 2008, and Continental's similar large drop likely stems from its marriage with United last year. Airlines often benefit from the cost savings brought about mergers. However, the layoffs that usually come with mergers, along with the issues of integrating two reservation systems and other complex business structures, can lead to the sort of snafus that give customers fits.